Every culture develops some kind of art as surely as it develops language. For five Chinese traditional painters from Beijing, China they shared their artistic ideas and opinions on mutual concern to local artists yesterday. The workshop which was held after the opening of the Exhibition on Selected Traditional Chinese Paintings at the China Cultural Centre in Suva. ‪The exhibition is jointly sponsored by China Cultural Centre, Beijing Municipal Institute of Culture and History Research, and Beijing People’s Association for Friendship with Foreign Countries. ‪Traditional Chinese Painting is a unique painting form originated in China with a long history. There are different types, mainly painted on the paper or textile, with brush pen and ink or color. Usually, on the paintings, the painter also can write a poem with Chinese Calligraphy, and put on a unique seal of the painter. 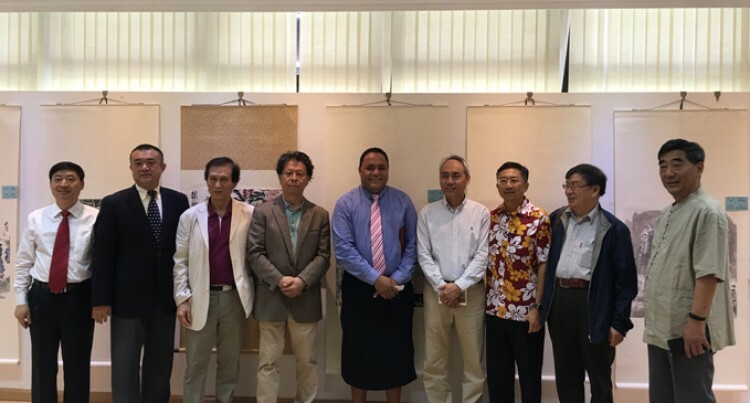 Director Heritage and Arts, Collin Yabaki said Fiji was lucky to have been given the opportunity to witness the exhibition of China’s traditional paintings. “The paintings on display today by our visiting friends from Beijing Municipal Institute of Culture depict the festivals, special customs and traditions, farming activities and a reflection of peoples love towards life,” Mr Yabaki said. “This cultural exchange programme will further deepen and strengthen the bilateral relations between Fiji and China. “I am indeed thankful to the executive arm of the government for their insight in forging this partnership as it births a new horizon for our developing Fiji. China Cultural Centre director Deng Xianfu said “We are exhibiting 35 paintings here all created by the senior painters from Beijing. “I hope the viewers here today can feel the beauty of the Traditional Chinese Paintings, and the painters from both China and Fiji can find the common viewpoint of the painting art and learn from each other,” Mr Deng said. This is the first time the China Cultural Centre is exhibiting the Traditional Chinese Paintings. The exhibition ends today.